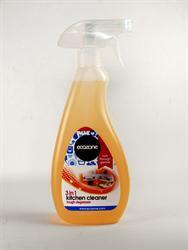 Cleaner- 500ml spray bottle which is ideal for ovens and hobs. 3. Formulated for a quick and easy clean. Buying this product will earn 38 Loyalty Points. Be the first to submit a review for the Ecozone 3 in 1 Kitchen Cleaner.